Panassie and Charles Delauney, who had co-founded the Hot Club of France five years earlier, were keen on producing a record with the visiting Ellingtonians. With Duke already under contract, they approached Stewart about making a session with Django. In addition to his numerous recordings with the Quintette of the Hot Club of France, Reinhardt had recorded with jazzmen Coleman Hawkins, Benny Carter, Eddie South, Dicky Wells, and Bill Coleman, and his renown was well-established on the American scene. Stewart recruited his Ellington colleagues, clarinetist Barney Bigard and bassist Billy Taylor, for the session. Despite its hastily-assembled nature, Gunther Schuller, writing in his monumental history The Swing Era, hails the Rex Stewart Big Four session as "extraordinary...soulful...among the finest achievements of jazz...crammed with an array of astonishing details." The language barrier was of no consequence either.“I was so overawed by [Django's] virtuosity," Stewart said, "That it never occurred to me there would be any communication problem, despite his not speaking English. And I was never so right. The gypsy picked up on the harmonies just as though he had written the music. A gesture toward the brandy bottle was all that we needed and everybody understood everything. "When Django played, his savage rhythmical impulses and tender, romantic nuances were underscored by his driving, rock-steady beat," wrote Stewart. "Django, in my opinion, was to the guitar what Louis Armstrong was to the trumpet or Art Tatum to the piano. He inspired the playing and thinking of countless guitar players all over the world. But he confounded the critics, who couldn't exactly label his work and were antagonistic to this gypsy with a song in his soul." 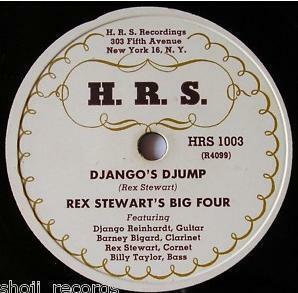 The group, which was billed as Rex Stewart and His Feetwarmers, recorded five sides on April 5, 1939. While Bigard deploys brushes on a newspaper to effect the sound of a snare drum on a couple of tracks, the music has an airy, subtly propulsive flow more typical of chamber jazz than of the hard-swinging small group recordings that Stewart and other Ellingtonians were making back in the States. Besides the up-tempo treatment of the Vincent Youmans standard, "I Know That You Know," there's little in the way of "savage" rhythm here, though Schuller was quick to point out that "there's nothing lightweight or effete" either. Schuller adds, "Whenever jazz might be called upon to demonstrate to its skeptics that it need not be and is not necessarily a loud, raucous...music, these tasteful performances provide perfect irrefutable proof." As for the Feetwarmers date and the fate of “Finesse,” he wrote, “That particular session was such a happy combination of musical inspiration and understanding, such a thoroughly happy blending of talents, that in later years it was hard to reconcile it with the events that ensued...The chain of events started on the band’s return to New York…I loaned my copies of the Paris date to my old buddy Brick Fleagle, because he was also a guitar man and I knew that he would enjoy Django’s artistry. So far, so good. That is, until he loaned my records to Steve Smith, who at the time operated a label, HRS. The next thing I knew, HRS had my Paris date on the market, only it had been re-titled Ellingtonia! Well, you can bet I was furious at this type of double dealing...I bitched and sputtered, [but] did nothing about it. Subsequently my friendship with Brick was never the same. Then, farther down the line, after my pal Billy Taylor had left the band, Johnny Hodges made a record of “Finesse,” but this time it was called “Night Wind,” and was credited to my boyhood buddy [bassist] Billy Taylor! And that is why truth may well be stranger than fiction." 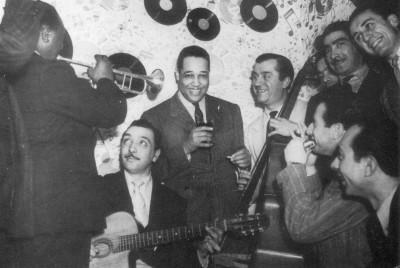 Stewart returned to France in 1948 for a tour of the Hot Clubs. While there he treated himself to "side trips to the Champagne wine country, the legendary cathedral in Rouen...Notre Dame and a walk along the Seine...Most important of all, I indulged myself in something I had longed to do-- attend class at the famed Cordon Bleu cooking school." He later put this training to use as the chef-owner of a restaurant near Bennington, Vermont. During the Paris sojourn, he lectured at the Cite Universite and hosted a radio show, an occupation he would resume at a station in Troy, New York. He also recorded again with Django. "I'm Confessin'" brings to mind Louis Armstrong, who first recorded the song in 1930, the year it was published. Stewart was devoted to Armstrong, who was also Django's primary model. 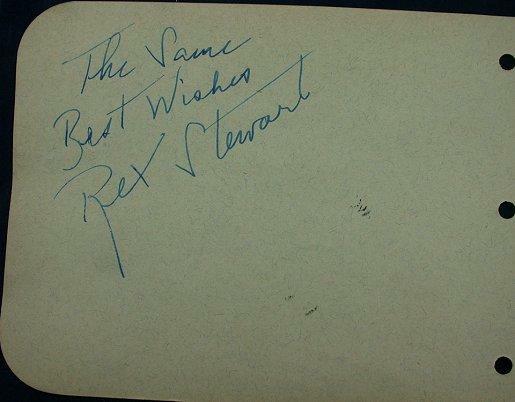 Rex said of Louis, "I was one of his most ardent admirers...I tried to walk like him, talk like him, I bought shoes and a suit like the "Great One" wore." Louis surprised Rex one night around 1925 when he stopped by the Nest Club where the teen-aged Stewart worked with Elmer Snowden. 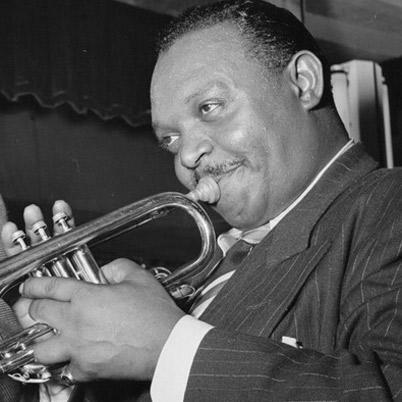 "It's an experience I will never forget," he wrote, "And I must have played pretty well because "Louie...took to dropping in from time to time." Stewart died in 1967. In the last few years of his life he contributed a series of articles to Downbeat, The Evergreen Review, and Melody Maker that were later anthologized as Jazz Masters of the 30's. Stewart's witty recollections and affectionate portraits of his colleagues, combined with what Jazz Masters editor Martin Williams calls "amazing powers of observation and perception," resulted in what is still the only substantial jazz history written by a major player that is not directly autobiographical. In the superb Boy Meets Horn, Rex saw to that too. Footage of Rex is quite rare, and the same is probably true for Nick Travis, who's best known for his work as a studio musician. But here they are on grainy footage from Art Ford's Jazz Party playing "There Will Never Be Another You." Think of that as an epitaph for Rex.